As I was trying to sort out the accounts of the New York Tea Party, one of my biggest questions was how the New York Whigs got advance word that James Chambers was bringing in tea. First another merchant captain told the Philadelphia Whigs, who sent word to New York. Then a third captain showed up with nearly the same information, which he had copied from Chambers’s Customs filings. And literally that tea was nobody’s business but Capt. Chambers’s—he had bought it himself, he was transporting it, and he would presumably pay the duty on it. Now the American tea boycott made tea everybody’s business for a while. But no one seems to have found it remarkable for information on Capt. Chambers’s cargo to reach New York before he did. Today companies operate on the assumption that most such commercial information is proprietary, not public. On Friday I attended a seminar at the Massachusetts Historical Society, where research fellow Hannah Tucker helped make sense of that question for me. A graduate student at the University of Virginia, she’s working on the patterns and practices of merchant captains in the eighteenth-century British Empire. In that period, I grasped from Tucker’s remarks, the uncertainty of Atlantic crossings, the difficulty of communication, and merchants’ and ship owners’ inability to supervise sea captains closely meant that they preferred an open information system to a closed one. It was in nearly everyone’s interest to know about other people’s business. If you tried to keep information within your firm, you could easily find yourself cut off with no information at all. Thus, sea captains sent their merchant employers signed copies of their bills of lading via two or three other captains—rival mariners working for rival merchants. Captains shared news with others they met at sea. After landing, captains were debriefed for news they had about other ships out of the same port. And apparently it wasn’t that odd for one captain to view the Customs documents of another. The session with Hannah Tucker was a “brown-bag seminar,” scheduled at noon (attendees can eat lunch during it); researchers early in their research discuss their current projects and what nearby documents they plan to examine. 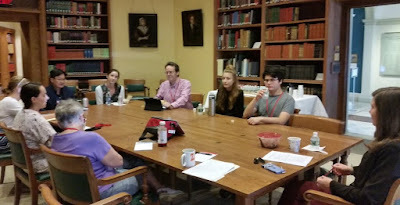 There are more formal evening series, including the Boston Area Early American History Seminar, when scholars share essays farther along toward publication. The M.H.S. just announced its schedule of events for the fall and beyond, and here are seminars that caught my eye because of their links to Revolutionary America. Silver coin was the primary commodity shipped to China from the United States in the late eighteenth and nineteenth centuries, some of which was reworked into silverwares by Chinese craftsmen for British and American buyers. This talk explores the different silver conduits of the American trade relationship with China. Far from a neutral medium, how were understandings of its materiality mobilized in cross-cultural transactions? Monday, 22 Oct 2018, 5:15-7:30 P.M. This seminar examines components of the Omohundro Institute’s multi-platform digital project and podcast series, Doing History: To the Revolution. It explores Episode 130, “Paul Revere’s Ride through History,” and the ways the topic was constructed through narrative and audio effects, as well as the content in the complementary reader app. Tuesday, 6 Nov 2018, 5:15-7:30 P.M.
Tuesday, 8 Jan 2019, 5:15-7:30 P.M.
Samuel Seabury’s consecration in 1784 signaled a transformation in the organization of American Protestantism. After more than a century of resistance to the office of bishops, American Methodists and Episcopalians and Canadian Anglicans all established some form of episcopal superintendency after the Peace of Paris. This paper considers how the making of American episcopacy and the controversies surrounding it betrayed a lack of consensus regarding the relationship between church, state and civil society in the Protestant Atlantic. Tuesday, 5 Mar 2019, 5:15-7:30 P.M. This paper argues that Mason Locke Weems’s biography of George Washington built a bridge between Washington and the world of Abraham Lincoln and Ellen Montgomery. Weems’s stories were not just expressing early-19th century cultural commonplaces, but helping to create them. The paper connects these transformations with Weems’s work to recover Weems’s importance within his own time. Tuesday, 7 May 2019, 5:15-7:30 P.M. Check out the M.H.S. Events page for other sessions about other historical periods, subjects, and approaches.